This small mod is just for the looks of the Game. 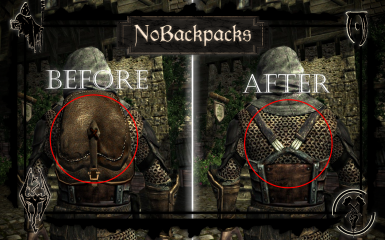 It changes the way backpacks look in Enderal. 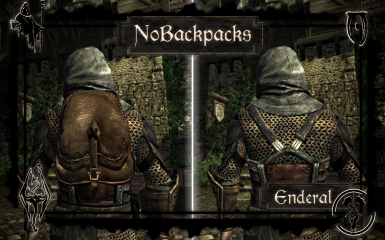 "NoBackpacks" has one simple purpose - making backpacks invisible. "Yeah, but why?" i hear people asking. Well, i don't know how you're playing Enderal but i'm playing a warrior with a two handed blade and i don't like it when my blade cuts trough my backpack every time i sheath my blade so i decided to make this little mod. Added a file for every backpack in the game. Added a file for each backpack in the game.